Okay ladies, listen up! Research suggests the female brain is more sensitive to the cold and dark, due to increased production of the stress hormone cortisol and a greater inflammatory response to environmental factors. This, unfortunately, makes us more susceptible to seasonal affective disorder (SAD) — a.k.a. the winter blues. So, what’s a woman to do? How about trying something weird and wonderful to lift your spirits, like banana skin tea? In fact, this tea may even help relieve insomnia, anxiety and depression. And it’s inexpensive and easy to make. So, sit back, put your feet up and get ready for a good night’s rest. Yes, banana peels are edible! Contrary to popular belief, banana peels are not poisonous. They’re actually edible and packed with nutrients. Sounds odd right? Well, the fact is, banana peels are eaten in many parts of the world — though not common in the Western world. But in their raw state, banana peels are thick, fibrous and somewhat bitter. So, not something you necessarily want to chow down on. Instead, reap the benefits of banana peels by boiling organic peels them for about ten minutes. Do you have trouble falling asleep or wake continually throughout the night? You may have a magnesium deficiency. Called the “invisible deficiency,” magnesium deficiency is often hard to spot and diagnose. This condition is also difficult to detect with medical tests since only one percent of magnesium is found in the blood. Most magnesium is stored in bones and organs. Therefore, a simple needle prick by your doctor often won’t help determine whether you’re deficient. But here’s the thing: your body needs magnesium for your DNA, all living cells, reproduction and protein synthesis (how cells build their specific proteins). Additionally, magnesium is essential for the regulation of muscular contraction, blood pressure, insulin metabolism, cardiovascular health, nerve transmission and neuromuscular transmission. And according to research, magnesium deficiency is linked to a variety of chronic diseases, including Alzheimer’s disease, diabetes, high blood pressure, cardiovascular disease, migraine headaches and even ADHD. Banana peels are a good source of magnesium and the tea is a great way to get magnesium into your diet. Magnesium also helps your muscles relax. So, drinking the tea about an hour before going to bed will help you get good night’s sleep. 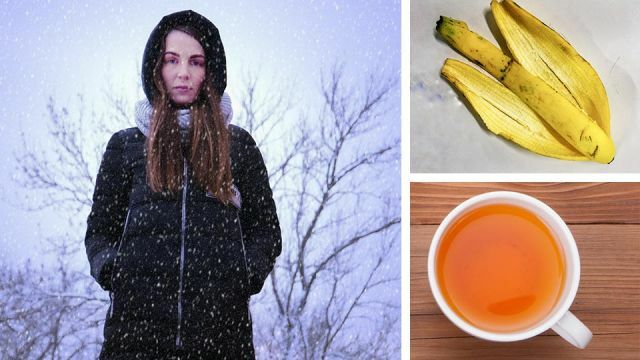 Banana skin tea can be helpful in overcoming symptoms of SAD thanks to high levels of tryptophan, according to Laura Flores, a San Diego-based nutritionist, for Live Science. The body converts tryptophan to serotonin, “the mood-elevating brain neurotransmitter,” says Flores. The tryptophan in bananas is also known for its sleep-inducing properties. Did you know that bananas are one of most heavily sprayed crops in the world? So, to avoid consuming pesticides, you should always make your tea with organic bananas only. Additionally, use a ripe banana — no green spots. An under-ripened banana could mean a bout of constipation. Strain water into a mug, then add cinnamon and honey. Drink one hour prior to bed. Like most alternative treatments, you have some fans and you have some critics — banana skin tea is no exception. Some critics believe that consuming the peels or even drinking the tea, for that matter, is more hype than healthy, since consuming raw skins are hard to digest and boiling them reduces nutrient value. Sure, most vitamins are sensitive to heat and tend to leach into the water. This is especially true for water-soluble vitamins like B vitamins and vitamin C. But cooking does not reduce the amounts of most of the minerals found in food, including magnesium. The exception is potassium, found in abundance in bananas and peels, which can leach into cooking water. Perhaps this is why drinking banana skin tea is an ideal way to get those minerals. So, what do you have to lose? Maybe pricy and dangerous medications for insomnia and the winter blues. Hey Buddy!, I found this information for you: "This Banana Skin Tea Recipe Can Help Insomnia And The Winter Blues". Here is the website link: https://www.thealternativedaily.com/this-banana-tea-can-cure-insomnia-and-the-winter-blues/. Thank you.